Thanks for giving this series of events some coverage and I hope you attend one of them. I think that it is important to give every Newham resident the opportunity to hear my oratory skills and what better forum than a briefing by me explaining why I’m tightening your belts. The phrase “Newham Together: facing the cuts as one” isn’t a spin on the ConDem mantra, it is in fact a summation of my credo regarding how best to view the impending cuts. The cuts will be more palatable to Newham residents when they realise that the most important resident – me, as endorsed by 64,748 other residents! – will remain financially secure. 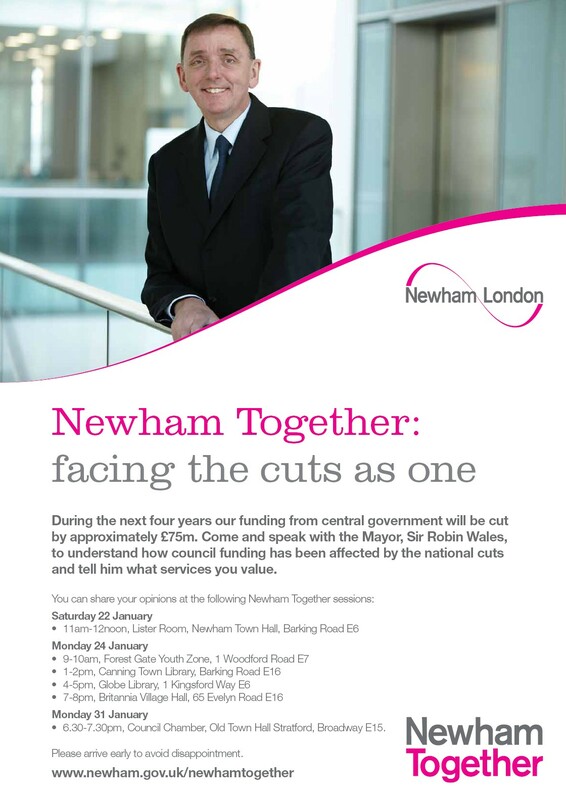 So all of Newham Together will be facing the cuts with the “one” (me) and be comforted by the fact that I, and my trusty Mayoral Advisers, will be all right. By the way, there is a typo at the bottom of the flyer, it should read: “Please arrive early to ensure disappointment”. The only thing I don't understand is why nobody within Newham Labour Party is willing to do anything about your corrupt and seedy little regime.